Born: Date not known, Germany. Julius Loevy, a German chemist, studied at the University of Breslau (now Wroclaw, Poland) and obtained the degree Master of Arts (MA). Continuing his studies in chemistry at the University of Heidelberg under Professor Robert Bunsen he was awarded the degree Doctor of Philosophy (PhD). 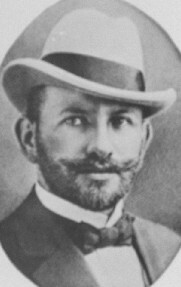 Early in 1891 he came to the South African Republic (Transvaal) and settled in Pretoria. In March that year an English translation of a German paper by him, "The tubercular and the bacillus, and Dr Koch's new method", was published in the Agricultural Journal of the Cape Colony (Vol. 3(18), pp. 170-172). It contained a popular account of Dr Robert Koch's* discoveries in connection with tuberculosis. The next month Loevy was licensed by the Republic's Raad van Examinatoren (Board of Examiners) to practice as an analytical chemist. He worked with Dr Jacques Schlesinger in the latter's chemical laboratory. While in Pretoria he participated in the activities of the Natuurhistorisch Gezelschap (Natural History Association), a little known society chaired by George Leith*. Loevy's more important research dealt with the chemistry of the recently introduced MacArthur-Forrest process for the extraction of gold from refractory ores by means of cyanide solutions. Between April 1892 and April 1893 he registered four patents in the Transvaal relating to this process. The first was for a method to render cyanide solutions harmless; the second for a method to increase the recovery of gold by means of cyanide solution and precipitation; the third, with Leopold Kessler*, for a method to purify gold after its precipitation and recover the metals used in the precipitation process; the final one concerned a new method for precipitating gold from solutions by means of electrolysis, while at the same time regenerating the solution chemicals. During 1893 Loevy visited Europe to purchase equipment and after his return set up an analytical and metallurgical laboratory in Johannesburg. There he performed inorganic and organic chemical analyses, including analyses of water, human remains, liquors and foodstuffs; toxicological, hygienic and physiological examinations; and microscopical and bacteriological investigations. In May 1894 he became a foundation member and served on the first council of the Chemical and Metallurgical Society of South Africa. He was re-elected as a member of council in 1895 and 1896, became vice-president of the society in 1897, and president for 1898/9. During 1898-1899 he was furthermore the first editor of the society's Journal, until publication was suspended at the outbreak of the Anglo-Boer War (1899-1902). Several accounts of his chemical investigations were read before the society and published in its Proceedings. Some of these were performed for the government of the Republic and concerned the quality of drinking water for Johannesburg and Pretoria, leading to a paper on "Johannesburg water from a hygienic standpoint" (1894, Vol. 1, pp. 50-55). However, his more important work still related to the recovery of gold and led to the presentation of several papers: "Notes on the action of alkaline sulphides in cyanide solutions" (Proceedings, 1895, Vol. 1, pp. 86-91); "Assaying of graphite crucibles" (1898, Vol. 2, pp. 205-207); an account of cyanide poisoning (Journal of the Chemical and Metallurgical Society of South Africa, 1899, Vol. 2, pp. 168-169); "The composition of slimes" (Proceedings, June 1898); and "Notes on the estimation of sulphides in cyanides" (Proceedings, March 1899). Other papers by him on the recovery of gold were published in German journals. In 1893 and again in 1895 Loevy indicated to the government of the Republic that he would like to be appointed as government chemist, but no such appointment appears to have been made. In September 1897 he became a member of the South African Association of Engineers and Architects. In 1899, at the outbreak of the Anglo-Boer War, he returned to Europe, but was still listed as a member of the (renamed) Chemical, Metallurgical and Mining Society of South Africa in 1905. At that time he worked for Ad Goetz and Co. in Berlin, Germany. Later he practiced in Brussels before settling in Chile, where he remained for the rest of his life. Agricultural Journal of the Cape of Good Hope, 1891, Vol. 3, Loevy's paper. Journal of the Chemical, Metallurgical and Mining Society of South Africa, September 1899, Vol. 2(9), list of presidents; 1904/5, Vol. 5, Members; 1920, Vol. 20, pp. 129, 146-147, Obituary notices. National Automated Archival Information Retrieval System (NAAIRS). http://www.national.archives.gov.za/naairs.htm Documents relating to Julius Loevy / J. Loevy / Dr Loevy.